Phoenix Law Enforcement Association > PLEA News > Phoenix Has Two New TOP COPS! Phoenix Has Two New TOP COPS! On May 14, 2016, at approximately 1400 hours, Phoenix Police Officers responded to a call of a possible home invasion with shots fired at an apartment complex located at 3737 West McDowell Road. Sergeant Steven Wong and Officer Marc Valenzuela were the first to arrive on scene and upon locating the apartment, were immediately ambushed by the suspect, who unbeknownst to the officers, had just shot and killed his girlfriend. Sergeant Wong was hit in the abdomen, but the round was stopped by his ballistic vest and Officer Valenzuela was hit in the arm. Despite the sudden and violent attack, coupled with injuries and the trauma of being shot, both Sergeant Wong and Officer Valenzuela were able to return fire and stop the threat. 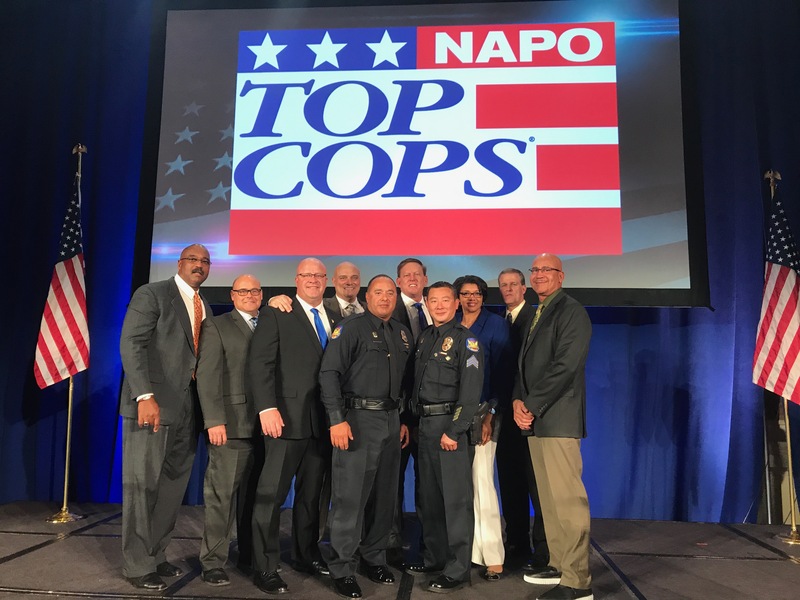 For their actions that day, Sergeant Wong and Officer Valenzuela received a National Organization of Police Organizations (NAPO) TOP COPS Award and were honored on Friday, May 12, 2017, in Washington DC along with other TOP COPS from around the nation. They join several other Phoenix Police Officers who have received this prestigious award. CLICK HERE for a related news story which includes body worn camera footage of the incident. Pictured from L-R, Assistant Chief Harry Markley, PLEA Vice President Michael “Britt” London, PLEA Treasurer Darrell Kriplean, PLEA Trustee Tim Baiardi, Officer Marc Valenzuela, PLEA President Ken Crane, Sergeant Steven Wong, Chief Jeri Williams, Executive Assistant Chief Mike Kurtenbach, PLEA Chairman of the Board Frank Smith.